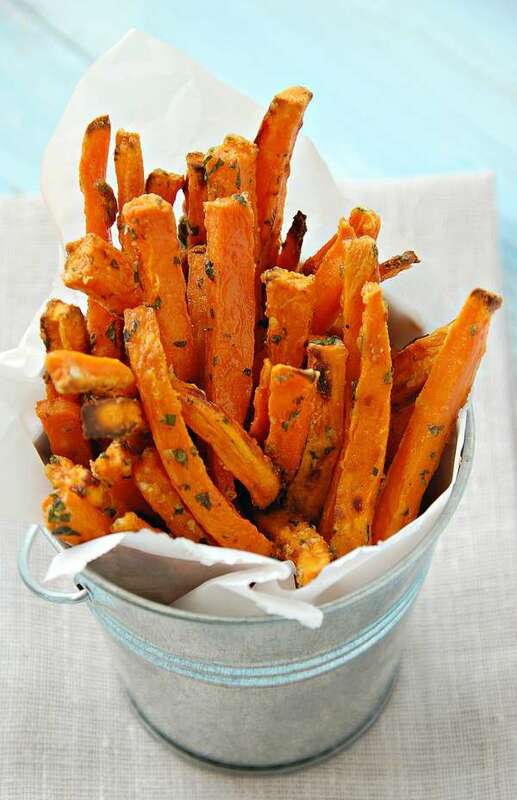 This is the perfect Paleo sweet potato fries recipe in the world! I’m serious, these fries are so good, they are crisp and so easy to make. Although fries are simple to make, it can be a little trickier to create a flavorful and tasty fry that is cooked through and not burnt. The fries are seasoned perfectly and they do not contain any ingredients you could not have if living the Paleo lifestyle. They are so delicious you won’t be able to stop eating them! You’ll want to me them every day. 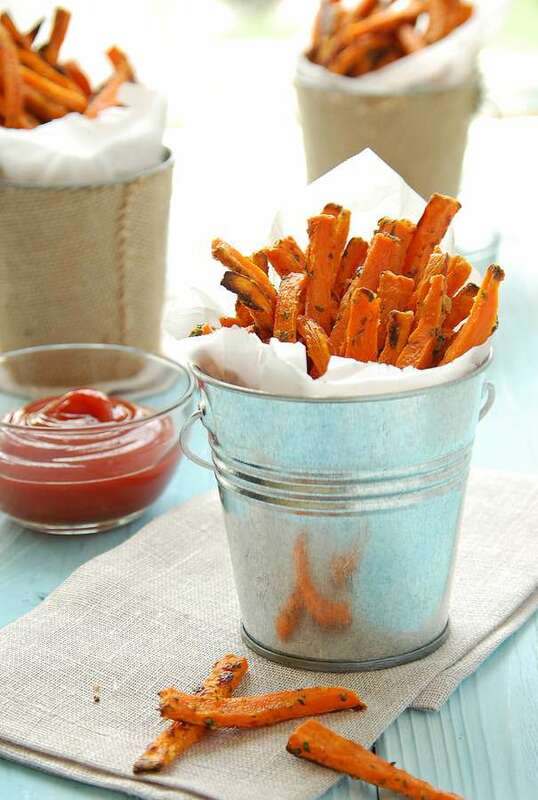 This makes perfect Paleo sweet potato fries because the light arrowroot starch coating on them makes them hold the seasoning and helps keep them from burning. 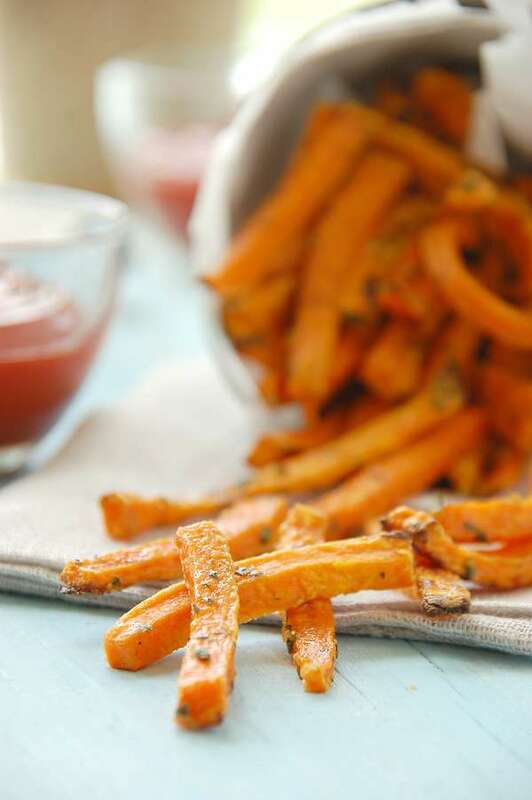 Before I started making Paleo sweet potato fries like this, I would always burn half my fries. But I love how just adding a simple coating gives them a crunchy/chewy texture that is addicting! It is not super tricky to have a Paleo Sweet Potato Fries Recipe but the other tricky part is having a condiment or dressing to dip them in. So the goal with this recipe is to enjoy eating them alone and not have to put any kind of sauce on them. However, if you aren’t super-strict Paleo and want a REALLY good sauce. I mean, the kind of sauce that will have you making these Paleo sweet potato fries as often as humanly possible, try this sauce. Oh, and have some good fermented pickles (like Bubbies) on the side with the sauce and these fries and you will be in heaven. The biggest tip I can give you to make these fries is to not overcook them. I can’t tell you how incredibly fast they go from not done to burnt. So the second you see any sign of dark brown/burning on the edges, get them out of the oven. They will actually crisp up a bit when they cool down. Although, I love the chewy texture of these sweet potato fries and don’t feel like they need to be crisp. They are great by themselves or with a sauce! So we hope that you try our recipe and let us know what you think about it! Some people say that sweet potatoes have too many carbs and starch and you shouldn’t eat them. Other people say that they can be eaten in moderation. You shouldn’t eat regular potatoes because they have way more carbs than sweet potatoes. It’s up to you whether you include sweet potatoes in your Paleo diet. I know many many people who do eat them. 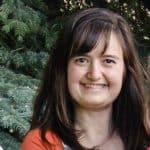 It just depends on how strict you want to follow the Paleo diet. 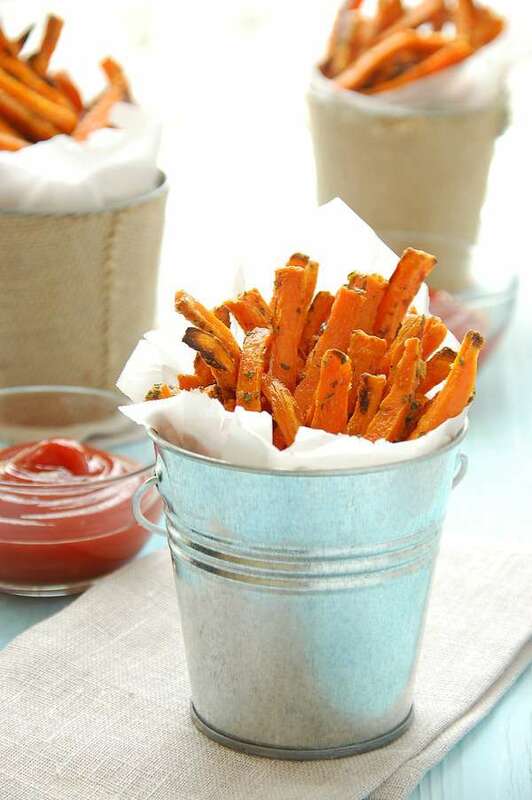 These fries are made of sweet potatoes, they are thinly sliced and cooked to a crisp. They are well seasoned for taste. parsley, salt, and pepper. Set aside. Peel the sweet potatoes and cut into thin, long slices, about 1/4″ thick. The thinner your slices, the crispier your fries will be. Place the sliced sweet potatoes in a bowl. Drizzle the coconut oil over the potatoes and toss until evenly distributed. even layers and not touching, if possible. What is the correct amount? 2 teaspoons? Oops. So weird how that got deleted. It’s actually supposed to be 2 dashes of ground pepper. Thanks for asking though, so I could fix it so other people don’t wonder what the measurement is. 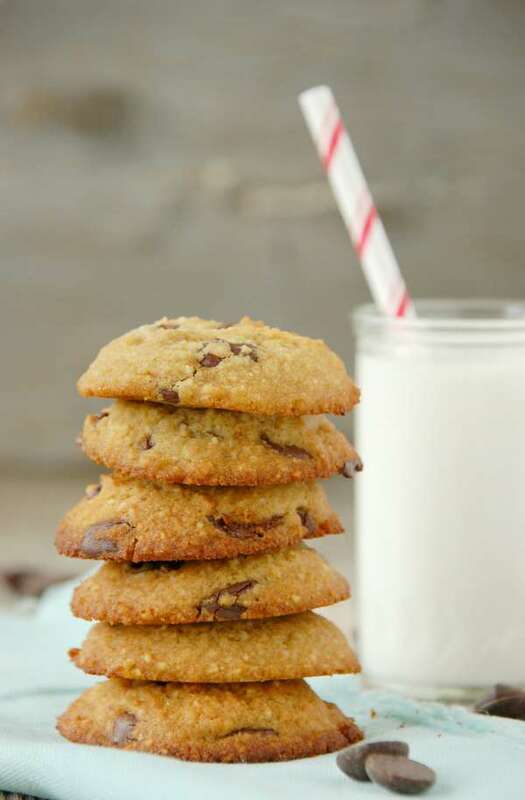 I love this recipe but when I made them I used too much arrowroot starch. My advice is to dust them lightly with the flour mix. Can you also use tapioca flour in place of the arrowroot? Probably. I haven’t tried it myself and it’s not the same thing, but close enough to be worth a try. I’m going to try these tomorrow. Thank you. I realize I’ve been cutting mine way to big and then they are mushy in the middle. So I’ll make them smaller. I was wondering what the purpose of the arrowroot does? Thanks again. The arrowroot coats them and gives them a nice crunch without burning and helps hold the spices on. 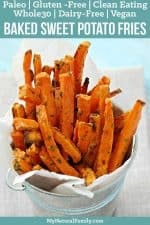 I always wanted a recipe for sweet potatoe fries that are crispy!! I also heard that if u soak the thinly sliced Derry potatoes in cold water for an hour it pulls some of the starch out of them which makes them crispy. Also baking them in a single layer helps too. Yes. I’ve done both of those things and it really does help, although I pretty much never have an hour to let them soak and I don’t know that it would do much for sweet potatoes. I love this recipe because you don’t have to soak them and they don’t burn nearly as easy. I definitely recommend a single layer though. Thanks for this recipe! I have been paleo for going on two months now and I really enjoy sweet potatoes and squash. This recipe will be a good addition to my easy and tasty list. i love sweet potato fries better than regular fries. Your so right we need something to dip them in but this sounds so good I could go without catchup. You have delectable food creations and I love trying them. TFS. It’s nice to hear from you. It’s a lot of work keeping this blog going and it’s nice people like you that keep me going. These look so good. Thank you for sharing your recipe! This is wonderful Rebecca. I love sweet potato fries. I use olive oil, but I have coconut oil which I will try next time. Also your spice mix is great.Here is what I also do Pumpkin Pie Spice with sugar and all natural Mystique Flavor Spice. I bought a Maya Coffee Rub (mix of chili spices/Maya coffee and Maya Cocoa w/organic cane sugar) at the Whole Foods Market, which I have been using with my roasted vegetables. Thought I would try it with the sweet potato fries.